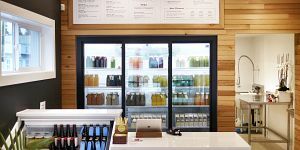 Great news for health-conscious residents of Edgemont Village, The Juicery Co. has opened a second storefront at 3130 Highland Boulevard and they’ve got all the sustenance you need to get through the day. Of course, their cold-pressed vegetable and fruit juice blends remain the biggest draw. They’ve added several new creations to their menu recently, including the Pacific, which is a green juice with black kale, apple, mint, lime, spirulina and alkaline water. Another newbie is their sprouted almond milk with locally-roasted Moja Coffee cold brew, vanilla bean, cinnamon, dates and sea salt. It’s so good it tastes like dessert. Drinks aside, you’ll find tons of locally made products also on sale at The Juicery Co. Edgemont, like Nourish Vancouver salads, Kits Kitchen Soups and Prima Bars. These ambitious juicing ladies aren’t done yet though — stay tuned for word of their Kitsilano store opening very soon.